Bears Ears Public Lands Disaster like Moab | RANGEfire! Conservationists in Moab, Utah, have been heartened by the strong statewide and national support for the proposed Bears Ears National Monument. Yet I was struck by how many people also say that they do not want to become �another Moab.�� This is a fairly common fear in the West. Depending on your location, substitute the idea of becoming yet another Aspen or Park City. In a way, it’s ironic. For years, Moab’s greens have touted the tourism economy as the alternative to all that nasty drilling and mining. Tourism, they say, avoids the worst of the boom-and-bust cycles characterized by pollution-spewing extractive industries. But everyone has learned that tourism also brings sprawling growth, crappy jobs, ever-higher rents and home prices, and an increasingly unmanageable crush of visitors and traffic. 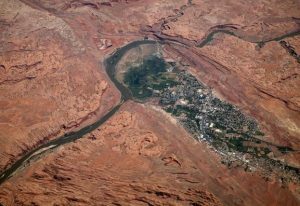 In Moab, tourism has transformed the area at least as dramatically as any drilling tower or potash pit. 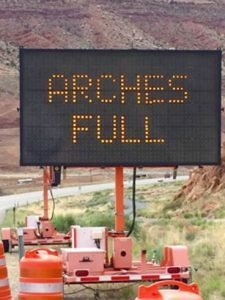 We deride the “drill-baby-drillers” for thinking that our natural resources are unlimited, yet we never hear anyone suggest a cap on visitors, even as our national parks become ever more crowded, smashing attendance records year after year. There is substantial evidence that tourism and lackluster stewardship have not benefitted most locals. Just in the last year, according to the Community Action Partnership of Utah, Grand County’s poverty rate jumped up to 16.3 percent, with Moab’s children hit hardest: 18 percent live in poverty households, shooting up to 49.6 percent for those children under 5 who live with a single mom. Half of Moab’s food stamp households include children. The average Moab renter gets a wage of $9.74 an hour, yet it takes $14.56 an hour to get into a two-bedroom apartment. Close to a third of Moab residents have no health insurance, compared to 12.5 percent for Utah as a whole. Moab’s average household income is $52,800, versus $69,686 for Utah. One-fourth of residential housing is occupied by tourists, leaving a serious housing shortfall for local workers. Two recent findings agree that the poor get hit hardest by tourism: Moab’s cost of living, housing costs, sales tax, and income tax are all higher than the national average, and Utah’s job growth in recent years has mostly benefitted middle- and upper-income households. Those who advocate for a Bears Ears National Monument like to remind everyone that our nation’s federal land is owned by the whole country, not just the local yokels. 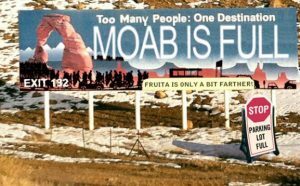 Yet Moab, to the disappointment of many longtime visitors, acts as though it believes that surrounding federal lands can be used to extract money from an infinite number of tourists, and to support an ever-expanding party and “adventure” town. Think how you would feel if someone proposed a 10,000-person “village” at Springdale, near Zion, or consider the horrifying actual plans for a gondola and restaurant at the Little Colorado confluence, at the eastern edge of the Grand Canyon. Do we commend their civic boosterism? No! We condemn mega-developments because Zion National Park and the Grand Canyon belong to all of us. Should President Obama create a Bears Ears monument, I hope Moab and the vacation marketers can restrain themselves from trying to cash in: No tourism boosters giving pep talks in Bluff, no flyboys pressing for scenic flights, no death-seeking extreme sportsters descending on Comb Ridge, no gluten-free bistros in Blanding, and no mass hordes of random tourons emanating out of Las Vegas, looking for that quick, bloodless Disney experience. Along with the Navajos and Utes in the remote villages of Aneth, Montezuma Creek, White Mesa, and Bluff, a surprising number of Anglos in the sleepy Mormon towns of Blanding and Monticello say they are also spooked by the prospect of industrial tourism. What will help is that the small towns within the Bears Ears area are separated by vast amounts of not much at all. �Remote�� doesn’t begin to describe this land of sculpted red rock. Recent history also gives us reason for hope, even if Bears Ears becomes a national monument. In 1996, President Bill Clinton went to the Grand Canyon to announce his highly controversial creation of the Grand Staircase Escalante Monument. You might think that tourism would boom the nearby towns of Escalante, Torrey, and Boulder. But no, they remain pretty much what they’ve always been in the face of increased but hardly Moab-level visitation. It may be too much to hope, but unlike Vietnam, in the Utah wilds it might be possible to save the villages without destroying them.